What is Feta Cheese and Its Popular Uses? Feta cheese is a rich and creamy soft cheese of Greece. It is authentically made of whole sheep's milk, although many varieties are now made with goat's milk or a mixture of the two. It has been around for centuries, and hardly a Greek meal does not incorporate feta cheese in some manner. Feta cheese is classified as a soft cheese made from 45 to 60 percent fat whole sheep's or goat's milk. The better fetas are aged (but not ripened) four to six weeks, cured in a salty whey and brine. Known as a pickled cheese, the flavor of feta becomes sharper and saltier with age. It is creamy white in color with small holes, a crumbly texture, and is normally found in square cakes with no rind. 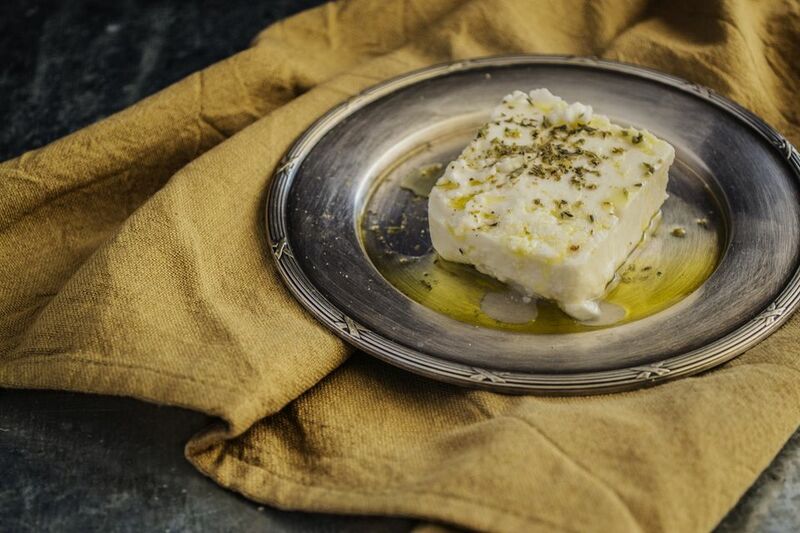 Feta cheese is so popular in Greece that very little gets exported. In fact, most of the imported feta cheese comes from Italy. Nowadays, many countries produce forms of feta cheese, including Australia, Denmark, Germany, and of course, the United States. However, modern-day, less robust versions may be made from cow's milk, skimmed milk, or partially-skimmed milk. Unfortunately, due to the great demand for feta cheese in Greece and restrictions on unpasteurized milk, you will probably have difficulty finding the real thing outside of Greece. If you do find it, it will be pricey. Most of us will have to suffer using an inferior but still serviceable imitation. If you are an amateur cheesemaker, can make your own feta cheese with goat milk. Feta is lower in fat and calories than aged cheeses such as cheddar or parmesan and has more calcium and B vitamins than soft cheeses such as ricotta or cottage cheese. However, it is high in sodium as a brined cheese and should not be used on a salt-restricted diet. Feta crumbles easily, making it a good choice to use in salads and to use as an alternative to shredded mozzarella on pizzas and flatbreads. Salads include the popular roasted beets with feta and also pairs well with roasted carrots and Egyptian spices. When using feta in uncooked dishes, such as appetizers, allow it to come to room temperature to get the best flavor. You can serve feta with olive oil and herbs on an appetizer plate, along with slices of crusty baguette, olives, and sliced meats. Or, make it quickly into a dip for crunchy vegetables or pita by blending it with a little lemon juice and oil. Another variation is a spinach and feta hummus as a dip or to use to fill a pita. Feta melts quickly in hot dishes and can be used as a filling for baked eggplant, savory pastries such as beet galette, feta phyllo triangles, or stifado. You might also use it in a quiche or feta cheese pie. It goes well in casseroles such as eggplant casserole or lamb dishes. Feta can replace other cheese in burgers and especially pairs well with lamb burgers. There are many ways to include feta, especially if you want to add a Mediterranean twist to a recipe. Feta is kept in brine until sold, and packaged feta will usually include some brine or oil. Keep it in the liquid to keep it fresher longer. It will sour if it becomes dry. It can last up to three months refrigerated if kept in liquid, but it is best enjoyed while fresh.